Standing at the junction of Eastcheap and Rood Lane in the City of London, our Guild Church of St Margaret Pattens was designed and built by Sir Christopher Wren between 1684 and 1687 at a cost of £5,000. For at least 900 years a church dedicated to St Margaret of Antioch has stood on the site. 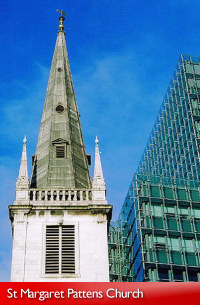 The present building succeeds the fourth known church which was destroyed in the Great Fire of London in 1666. The Church takes its name from the Pattens that were made and sold in and around Rood Lane. Since the 15th century the Worshipful Company of Pattenmakers has been associated with the church and panels bearing the name of Past Masters can be seen on the south wall. A notice in the church still requests “women to leave their Pattens before entering”. In 1954 St Margaret Pattens ceased to be a parish church and became one of the City’s Guild churches, within the living of the Lord Chancellor and under the jurisdiction of the Bishop of London. During the 2000 Millennium Year the Company presented the Guild church with new chandeliers and a winch system (in conjunction with the Worshipful Company of Basketmakers). A stained glass window of the Company’s Arms was also dedicated in 2000 as a further part of the Millennium celebrations. The church also houses two bells, recently restored at the Whitechapel Bell Foundary, one of the bells pre-dates the Great Fire. The Church is used by the Company each year for its Ascension Day service, and also a Christmas service of lessons and carols. The Church and Lady Chapel are open for prayer and contemplation from 10.00am to 4.00pm on weekdays and there is a sung Eucharist every Thursday at 1.15pm. The Company’s Honorary Chaplain is the Reverend Andrew Keep and the Church Administrator is Chris Moore. The Company’s Churchwarden is Mr Donald Newell. For more information on St Margaret Pattens Church please click here.